For a while i have been trying to build a political Queen Marchesa deck, but i have been cutting and adding cards forever never finding the 99 i want to run. So i was hoping you could help me of considerations of more cards, and maybe themes to cut. Pillowfort effects that can protect me and let me keep the monarch. Ghostly Prison & No Mercy like effects. Punish effects, I kind of want to make a sort of rakdos damage theme in the deck as well, like effects such as Polluted Bonds , Painful Quandary , Repercussion & Mogis, God of Slaughter that can win the game over time. StopShot on How to make enchantments indestructible? Run punisher effects such as Karmic Justice and Martyr's Bond . Also run Enchanted Evening which will wipe the board as well if they remove all your enchantments. Having threatening effects can often be a good deterrent. 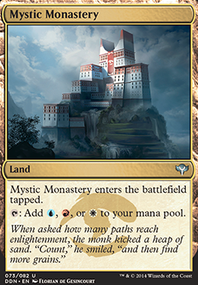 If you run a Sensei's Divining Top or Scroll Rack you could consider running Counterbalance as a reliable way to stop mass hate. Ice Cave is another option considering mass enchantment hate is primarily white and green which is in your color wheel. NoOneOfConsequence I actually did playtest your deck once (I know, it isn't a great sample size by any means), yet many cards are an issue. I apologize, I really want to like a deck you post, just to not make this a dramafest, but I can't say a bad deck is good. Damnation and Wrath don't need to be put into the deck at all. Call to the Grave A slow, grindy, 5 mana variant of Porphyry Nodes . Erebos, God of the Dead - A card that is indestructible, yet a worse Greed , a card that is too slow for even grindy stax lists in cEDH most of the time. Tutor for Greed is better than this. Doomwake Giant - Interesting repeatable board wipe, a meta-dependent inclusion though, not good for the average cEDH meta, but does have a place in some lists. I'd drop, but could imagine many arguments for it's inclusion. 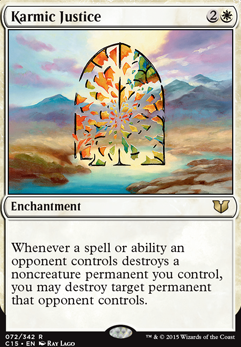 Ghostly Prison - anti-attacks, which just rarely comes into play outside of kiki-lines and the sort, a strange meta-dependent inclusion, but I coudl much less justify this one. Karmic Justice - Cool card, but often enchantment removal comes in the form of bounce or exile, and so this effect feels very off. Vindicate - 3 mana remove 1 thing is a lot of wasted mana, easy drop. 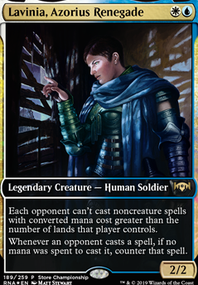 No Mercy - Really a lot of attack-hate, strange for a stax list with a commander that generates blockers. Easy drop at a 4 mana do nothing enchantment. Knowledge Pool - I get the Eidolon of Rhetoric / Rule of Law combo with it, but many decks have better value engines than Daxos, or can respond by killing one of the pieces, or can kill Daxos. These make this combo rarely an easy way to finish the game, requiring a ton of setup/backup that survives the lock. I think better options exist. Sigil of the Empty Throne - A slow, 5 mana do nothing enchantment, it takes forever to get this going, easy drop. Sphere of Safety - This much creature-attack hate? How much do you need? 1 card is often too much with Daxos in the CZ, but you run... including sweepers... like 11? Wow. 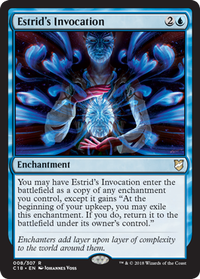 Your meta must be all Edric and Blood Pod, maybe 1 Kess Twin, nah, just all Edric decks. 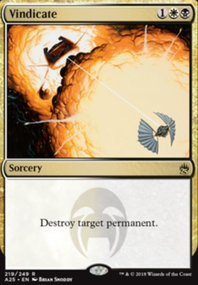 Damnation / Wrath of God - Too expensive for a Sweeper, honestly Toxic was all you needed with Humility as well. Pestilence - 5 mana to get a worse Electrickery , 6 mana to get a worse Pyroclasm , Sweltering Suns without cycling for 7 mana. Just really slow and weak, easy drop. Black Market - maybe in a meta with 50 Edric decks. Outside of that, easy drop. Coalition Relic / Worn Powerstone - just slow ramp spells, not bad cards, but Fellwar Stone / Everflowing Chalice comes first. 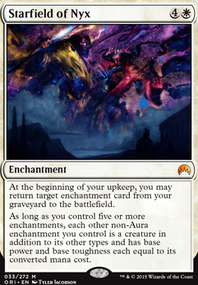 Infernal Tribute - Cool jank, not useful next to cards like Dark Confidant that is excluded. 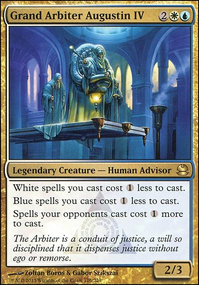 Academy Rector - Just no great targets like Pattern of Rebirth in color, great card, just not here. Grim Tutor / Idyllic Tutor - Just a bit too slow at 3 mana for a tutor. Love them, just gotta leave them. Hard drop. Land Tax - should run the Geddon/Ravages package or leave this out. Replenish / Open the Vaults - This deck doesn't run enough ways to sacrifice/ Entomb enchantments to make me want to include the cards. Mesa Enchantress - Slow card draw on a weak creature is just removal bait, this deck has better cards for the slot. Harder drop. Phyrexian Arena - A lot of math goes into why this card is generally pretty bad. Inefficient and weak in most circumstances, and needs almost 5 unimpeded turns to get enough value to be okay. Better cards for the slot. Cabal Coffers - big mana, not worth it outside of ANS. Vesuva - copying a land to enter tapped leaves you in a lack of mana. Weak card. Command Beacon - easy drop, weak card. Deserted Temple - Easy drop, weak card. Strip Mine - Good card, not here. Wasteland - Same as Strip Mine but worse. That would be the deck. I would recommend Dwarven Recruiter. It is absolutely NUTS with Depala. I also noticed that a lot of your dwarves have very little impact on the game state, so I would recommend some dwarves like Dwarven Miner, Dwarven Blastminer, Dwarven Bloodboiler, Master Trinketeer, Toolcraft Exemplar, Restoration Specialist and Bloodfire Dwarf. 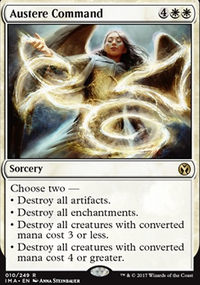 Also, Lightning Bolt and Lightning Helix are not particularly good in EDH, I would recommend some other removal like Crib Swap and Afterlife. Finally, I would recommend Karmic Justice as another way of protecting from Vandalblast.